It takes very special materials to make actual superconductors, but you can demonstrate the principles of superconductivity with a simple aluminum frying pan, a magnet, and a bit of liquid nitrogen. Have some fun with a semi-levitating magnet on a semi-superconductor. Superconductors are materials that, under normal circumstances, conduct electricity rather unimpressively, but drop the temperature enough and they become marvels of conductivity. In every material that conducts electricity there is a certain resistance to the flow of the electrons. It's this resistance that leads to a lot of the inefficiency and the energy-consumption that comes with electronic devices. When resistance drops to zero, not only will the power flow unimpeded, it will flow even without a voltage being applied to the device. Electricity runs forever. But only when the metal is chilled to, at the most, thirty degrees above absolute zero. This requires so much energy - chemical or otherwise - that any gain from the lack of resistance is negated, and so superconductors are used for only specialized purposes. One of those purposes seems to be showing off. Magnets interact strangely with superconductors. For one thing, they are repelled by superconductors at close range, and so rise up and away from them. However, they are also fixed in place by the electromagnetic field around them, and so instead of flying away from the superconductor, will levitate a certain distance from the material. 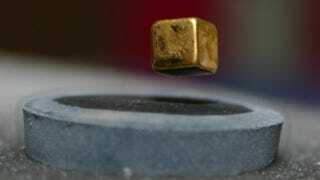 Scientists demonstrate this levitation by putting them on a superconducting track and having them 'run' the course, hovering always a certain distance away from the material. It may be tough to get your hands on a superconductor, and to chill it the necessary amount, but that doesn't mean you can't try a little magnetic magic with some relatively easy-to-get materials. All you need is a magnet, an aluminum pan, and some liquid nitrogen. Hold the pan at an angle and let the magnet slide down the back. The movement of the magnet, though slight, creates an electric current in the pan. The electric current creates a magnetic field of its own, and the two cling to each other. Sadly, most of the time they can't cling hard enough, and the magnet eventually drops away. This stops the movement of the charge in the pan, and it's all over. Now pour some liquid nitrogen into the pan, and wait while the whole thing fizzes and spits until it evaporates, leaving a very cold pan. Flip the pan, angle it, and try the magnet again. Aluminum is not a superconductor, so you won't get the same dramatic levitation that those substances do. However, you'll get much slower movement of the magnet sliding down the pan, and a longer time before the magnet drops away. The liquid nitrogen's cooling slowed down the moving atoms in the magnet. This causes them to stop jostling and slowing the electrons moving through the pan, decreasing the resistance and increasing the flow of electricity. The higher fields created by this higher flow slowed down the magnet, letting you get a little slice of superconductivity in your own back yard. Good job. Now go inside, and make yourself some bacon and eggs. See if you can taste the extra nitrogen. More information via The Naked Scientists.